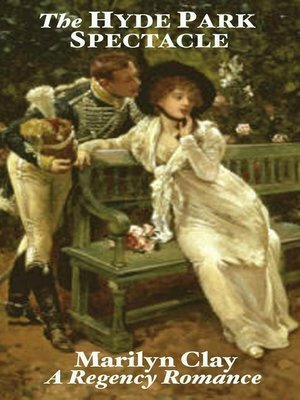 THE HYDE PARK SPECTACLE by Marilyn Clay is a clean, sweet, wholesome Regency romance. Miss Tessa Darby grew up in American. Now she has returned to England to escape the tyranny of a cruel stepfather and try to reform the harsh child labor laws of her birth country, Harrison Belmour, the Earl of Penwyck is the very sort of influential gentleman Tessa wishes to impress with her plea. But a more self-righteous man she has never met! Lord Penwyck is having the devil of a time controlling the deplorable behavior of his mother's houseguest, the lovely, auburn-haired, spectacle-making young lady from America. The stubborn chit simply will not take direction and the last thing the aristocratic family needs is another scandal! Still, the earl has to admit there is something refreshingly tantalizing about a beautiful woman who is also principled and intelligent. Yet, he refuses to believe he is falling in love with the willful young lady, even if he continues to reflect on what a perfect countess she would make! "Ms. Clay handles social reform issues in Regency England with aplomb! A perfect blend of romance and humor within a captivating plot. "–Red River Reviews. MARILYN CLAY's recent Regency novels include the critically acclaimed Miss Juliette Abbott Regency Mystery Series. MURDER AT MORLAND MANOR, MURDER IN MAYFAIR, MURDER IN MARGATE and MURDER AT MEDLEY PARK are all now available in both print and Ebook. Book 5 in the Juliette Abbott Regency Mystery series will be out in late 2018. If you enjoy the clean, sweet Regencies of Hanna Hamilton, Joan Smith, Charlotte Stone and Eleanor Meyers, you'll also enjoy the traditional, clean, sweet, amusing Regencies by Marilyn Clay, all suitable for teen readers, with no strong language, graphic scenes or violence.